We’d love your help. 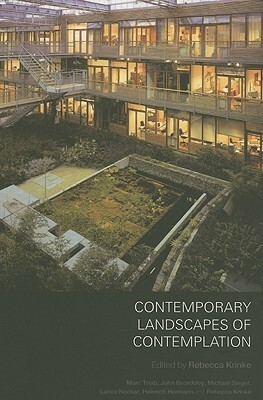 Let us know what’s wrong with this preview of Contemporary Landscapes of Contemplation by Rebecca Krinke. Contemplative landscape and contemplative space are familiar terms in the areas of design, landscape architecture and architecture. Krinke and her highly regarded contributors set out to explore definitions, theories, and case studies of contemplative landscapes. The contributors, Marc Treib, John Beardsley, Michael Singer, Lance Neckar, Heinrich Hermann and Rebecca Krinke Contemplative landscape and contemplative space are familiar terms in the areas of design, landscape architecture and architecture. Krinke and her highly regarded contributors set out to explore definitions, theories, and case studies of contemplative landscapes. The contributors, Marc Treib, John Beardsley, Michael Singer, Lance Neckar, Heinrich Hermann and Rebecca Krinke have spent their careers researching, critiquing, and making landscapes. Here they investigate the role of contemplative space in a post-modern world and examine the impact of nature and culture on the design or interpretation of contemplative landscapes. To ask other readers questions about Contemporary Landscapes of Contemplation, please sign up.